How many times have you planted tomatoes only to have them develop a black or brown leathery area at the blossom end (the end opposite the stem) of the fruit? This condition, which is known as blossom end rot, black rot or dry rot, can be very frustrating to gardeners. Not only are the infected tomatoes unsightly. They certainly won’t win any prizes at the local fair and many of the tomatoes may be good for absolutely nothing. 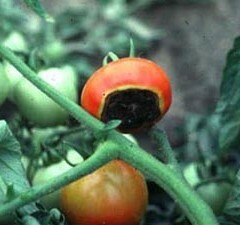 In fact, experts estimate that a gardener can lose as much as 50 percent of their tomato crop to black rot. Fortunately, there are a few things you can do to insure that your tomatoes are free of blossom end rot, which is a physiological disease usually caused by a calcium deficiency in the soil at a critical developmental stage. Other causes include drought, high levels of salt in the soil, excess nitrogen and uneven soil moisture. The most important thing you can do to avoid dry rot is to maintain an even level of moisture in the soil by irrigating and mulching. Make sure the growing site drains well and that the soil is aerated. Understand that plum- or pear-shaped tomatoes are the most susceptible to dry rot. If your tomatoes are regularly plagued with blossom end rot, you may want to start the growing season by using a soil test kit. The ideal pH level is 6.5. The calcium level of the dirt should also be checked. In the event that the soil is calcium-deficient, gypsum, superphsophate or high-calcium limestone can be added to the dirt. Avoid adding excessive nitrogen fertilizer, especially just before and during the time when the fruit are developing. Tomato plants that show signs of dry rot can be sprayed with kelp, which is available in most garden stores.